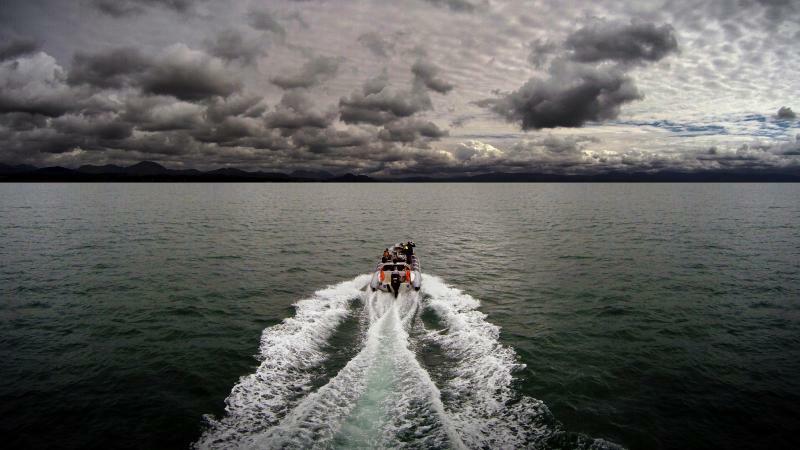 We cater for individuals or GROUPS of any age from 4 years old wanting a one hour RibRide, to those more adventurous chartering a rib for the day to go around Anglesey or to chill out on a secluded beach. 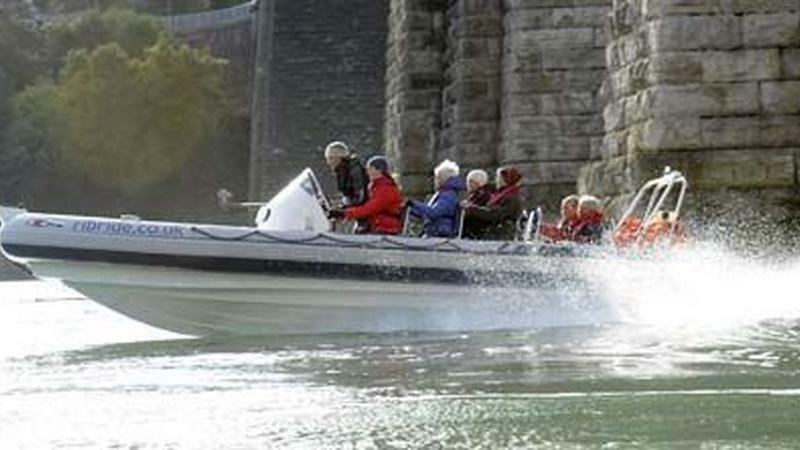 Our boats leave from our base at Menai Bridge (right next door to the fabulous Dylan's Restaurant) all year around. We also operate from Holyhead Marina, Beaumaris and Caernarfon during the summer season. 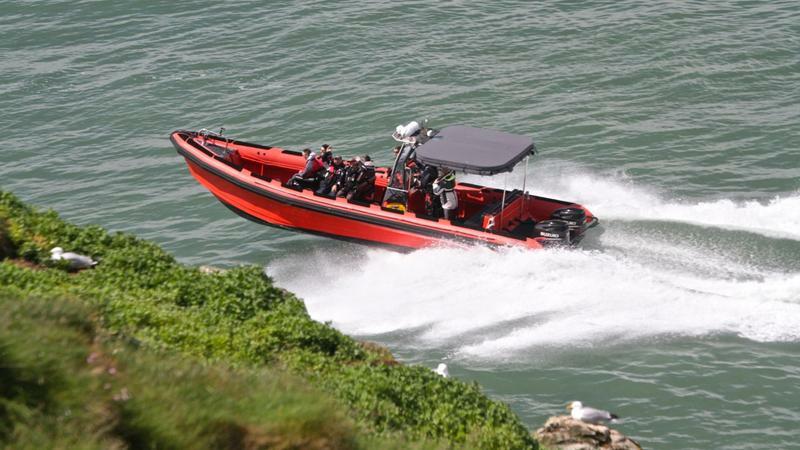 Fans of remote island adventure can join our RibRide Explorer Trips from Holyhead. RibRides require no skill, just the ability to make one largish step down into the boat, see our FAQ's. Outside of extreme weather and the odd splash you will not get wet.... unless you want to! We provide the lifejackets, all you need are soft soled shoes or boots and clothing suitable for a 5-8 degree drop in temperature. You can either book online or call us on our local rate number to discuss your RibRide. We take all major credit cards. Going under Thomas Telford’s Menai Suspension Bridge, we enter the infamous Swellies with its shipwrecks, rocks and whirlpools. We whip under the Britannia Bridge to spot the Lions and salute Lord Nelson’s statue. After viewing Plas Newydd, we return to Menai Bridge and on to see ‘Millionaires Row’. A unique view of Beaumaris Castle and the town’s brightly coloured seafront houses will delight you. Our skippers are your fast and fun guides to the history and wildlife around Puffin Island. You will have the best view of Caernarfon Castle. Going to Abermenai Point we pass the historic Napoleonic Fort Belan. Past the beautiful sand dunes of Newborough Warren we arrive at Pilot Cove, Llanddwyn Island. With luck we will spot seals, possibly Harbour Porpoises, then head back. Our skippers are your fast and fun guides to the beauty of the seascape and history of the area. 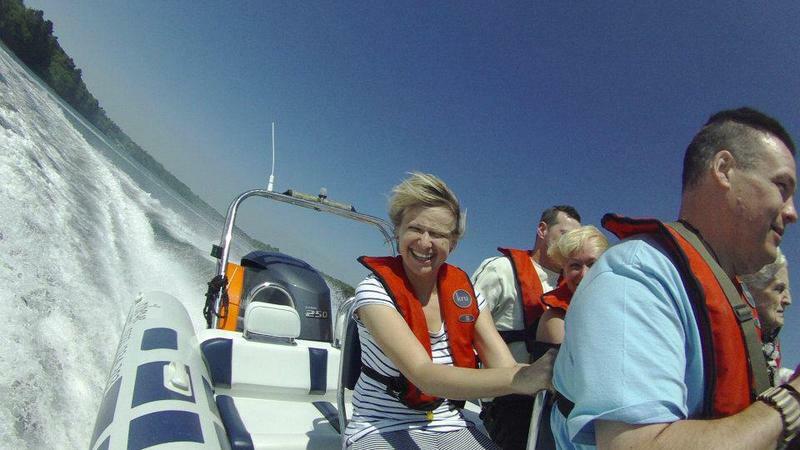 This trip is designed to suit your party of up to 8 riders per boat. You decide where and when to stop and you spend the whole day exploring. 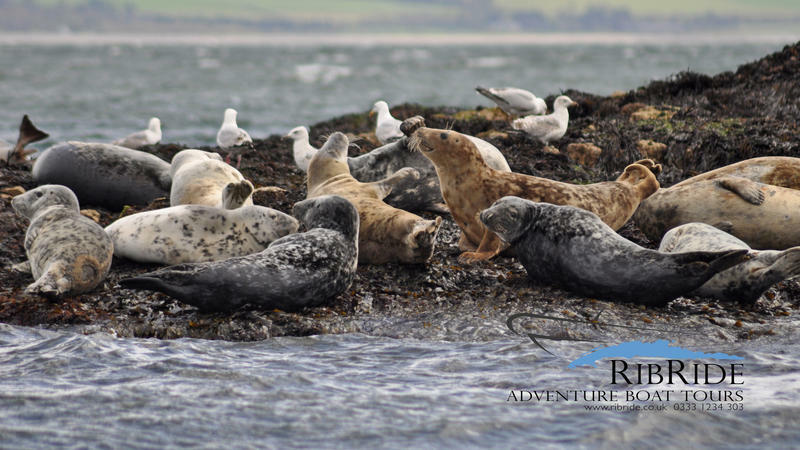 You will get up close with the sea wildlife and experience the thrill of an open-sea adventure at your own pace. Not for the faint-hearted! Our skippers will be your fast and fun guides for the day as you set off for an unbeatable adventure. 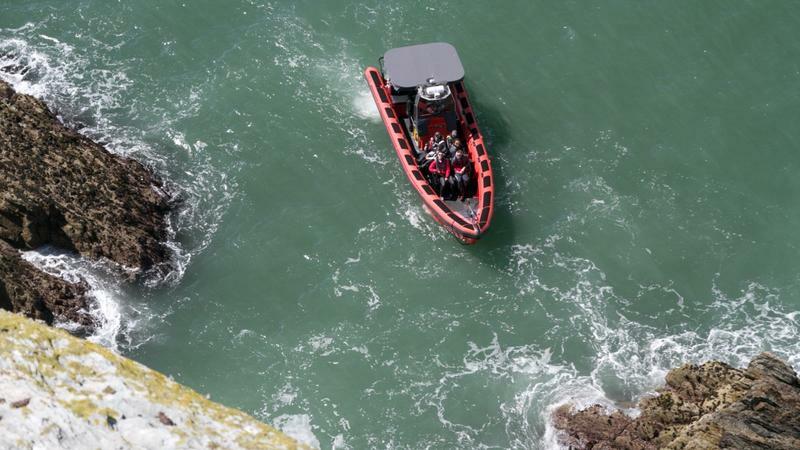 Gogarth-Sea Cliffs and Sea Birds aboard our Bear Grylls RIB. Leaving Holyhead Port, we pass the longest breakwater in the UK, and head around North Stack. Swinging into Gogarth Bay to get a unique view of some of the highest sea cliffs in Wales. As we head to the island of South Stack, we will spot some star species at the RSPB South Stack Cliffs nature reserve. We will also see the spectacular South Stack lighthouse, built in 1809, before we return. Our skippers are your fast and fun adventure guides to the dramatic landscape and spectacular sea birds. From the Port of Holyhead, we follow the craggy north Anglesey coast, we turn north west to reach the Skerries, a unique group of rocky islands with a very large Arctic Tern population (over 2,000 pairs), Common Terns, Roseate Terns, Puffins and Kittiwakes. We then begin the adventurous nine-mile open-sea crossing to the island of North Stack. Here we explore the caves and the dramatic 100m high sea cliffs of Gogarth Bay to reach the lighthouse on the island of South Stack. We will watch the sea birds at the RSPB South Stack Cliffs nature reserve before we return. We are a highly awarded experience, check out our Facebook and TripAdvisor pages to see what people say about us. In May 2017 we received a prestigious Blue Flag Award as a Sustainable Boat Tour Operator. Basically, we are the best at what we do and we don't mind shouting about it.